Good crispy pizza for South America, decent size. Not a restaurant you pick for the ambience (about four tables and the set up mainly for delivery), but worth it if you just need a pizza. No alcoholic drinks available. 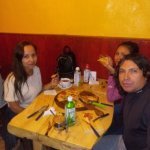 Been to El Chileno Pizzeria? Share your experiences!